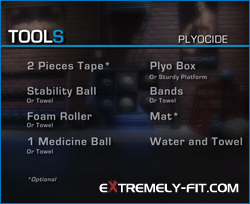 In this P90X2 review, it’s all about Plyocide. Not to be confused with suicide, lol. Am I the only one that thinks suicide with the word Plyocide? If I reviewed the P90X2 fitness guide correctly, this is the only cardio workout in the program. I guess it’s the only “official” cardio workout. There will be plenty of blood, sweat and tears throughout P90X2, that’s a guarantee! Your heart rate will sky rocket in other workouts as well, whether they are quote unquote cardio workouts or not. The P90X2 calendar also has P90X2 as a five day workout. So you have another day to use as you see fit. To start out, you may enjoy the extra Recovery day as you adapt to the new program. Further along your 90 day journey. you may enjoy adding in another activity, a sport you enjoy, going for a run, or doing a cardio DVD from another Beachbody program. Do what you want with this extra day. I actually love the idea. Tony Horton is giving us I a day to do as we see fit. Figure out what works best for you and your goals, and make it happen. Simply brilliant. 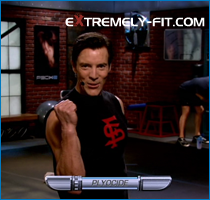 Okay, enough said, Now let’s get back to the P90X2 Review – Plyocide. P90X2 Review – Plyocide or Suicide? cardio rotation, and just prior to the 12 minute stretch and it was around 530. So the majority was from the warmup, stretch, and cardio. I imagine the last 100 or so calories was from the “afterburn effect” where my heart is still high, and the body is still burning calories, even though the workout is over. Gotta love that.statistics from my heart rate monitor. Total calories burned: 638. Max heart rate 175 (wow). Average heart rate 137. While my total calorie burn was 638, I looked down after finishing the cardio section, and noticed that I had burned about 530 calories. So the last 100 or so was simply an “afterburn” effect from the cardio. Pretty cool. This workout is approximately 55 minutes in length. The warm up starts using a balance ball, which I highly recommend you have. If you don’t have one, you can use a towel instead. You can also use a towel if you are traveling and don’t have immediate use of a balance ball. The warm-up moves are called: Twist, Squat, Side Stretch, Alt Back Lunge, and Atlas. Warm up is about 4-5 minutes. Still part of the warm up, but deserves it’s own mention. Foam rolling. I love the addition of foam rolling. If you don’t have a foam roller, there is someone on the DVD demonstrating normal stretches. Again, if its within your means, get a foam roller. You work somewhat independently on the foam rolling, You get the opportunity to work what needs the most attention, which I enjoy. I’m also looking forwards to the Recovery + Mobility DVD which should give detailed instruction on various techniques. You’ll spend an additional 4-5 minutes on foam rolling. From foam rolling, you’ll do additional warm up exercises, getting prepared for the punishment on your legs. Did that scare you? I’m not trying to. 🙂 I’m starting to notice a pattern with the warm-up exercises. Roller Sphinx, World’s Greatest Stretch, Inch Worm, Scorpion, and Groiners. This takes another 4-5 minutes. Now we jump, jump, jump into the cardio workout. And you might have picked up on the word jump. After all Plyo is jump training. The cardio workout is broken down into 5 rotations. Each rotation has 4 moves. So you will complete a rotation of 4 exercises, take a 40 second water break, and then complete your second rotation, another water break, and continue for 5 rounds. I noticed that the 4 moves appear to be in the following order. A slow methodical exercise, followed by a plyo lunge exercise, then a speed exercise, and another plyo exercise. So while completing the workout, you can go “all out” on your rotation, because after the rotation, you get a 40 second water break to recover slightly, then the next rotation starts with a slow methodical exercise, so you can further recover. Then the last 3 moves again, go “all out”. I was hitting a max heart rate of 175, but would recover again in a typical HIIT fashion. Your heart rate goes UP then back DOWN, back UP…. etc. So the cardio workout is only 30 minutes, but you are maxing it out at the same time. The great thing about this, you can always jump higher, use heavier med balls (if you have them) or go faster on speed exercises. A lot of room for growth. Here are the moves of each rotation. You should see some new workout moves here, all new material, with some similarities. Wide Leg Tiptoe Squat, Killer Katherine Lunge, Fast Feet Chair Jump, and Slalom Line Jump. The cool down and stretch is 12 minutes. I said it in past P90X2 Reviews, take full advantage of this time. Speaking from my perspective, I have to learn to recover, and not just stay in “overdrive” all the time. Don’t think if you aren’t maxing your heart rate, or burning calories, or going 100 mph, that you aren’t getting the full benefit of a workout. Prevent injuries, let your muscles and body recover for once in your life! (Talking to myself mostly, I’m guilty as charged). I’m “making” myself appreciate this recovery time, and I fully expect that my body will respond in a positive way. Can you travel with this P90X2 workout? Yes. This workout can be easily modified to use while traveling. No excuses! Let me sum up the necessary P90X2 Equipment Needed. 2 pieces of tape are used to mark lines on the floor. If you can use your imagination go for it, otherwise, just make an X on the floor. Stability Ball and Foam Roller, i encourage you to get, otherwise a towel is fine. The plyo box was used for only one exercise. I wouldn’t buy a box for one exercise, unless you want to. I got a cheap aerobic step at Wal-Mart. I encourage a Medicine Ball, but use a towel if you need to. You need a soft surface and good shoes, a mat if you can. You will likely have bands already, but if not a towel works fine for stretching. If you worked hard, and sweat as much as I did, go treat yourself to a recovery drink. I use this product on days that I worked to the MAX. This was one of those days. I hope you enjoyed my P90X2 Review, and that you find it beneficial in some way. Will you please take a moment and share it with others using the options below or posting a link on Facebook. I also appreciate your support, visit our store the very next time you have a need for Beachbody products or supplements. We are an authorized distributor, and appreciate your business! We all need help sometimes, someone to push up further, hold us accountable. Kick us in the pants when we start to slack. 🙂 If I can help you, or if you have questions, please feel free to contact me or comment below. If you have your own thoughts on Plyocide, and want to share your opinions, just leave a comment. Good luck with P90X2! If you want to read another P90X2 Review, you can find them all by clicking here.